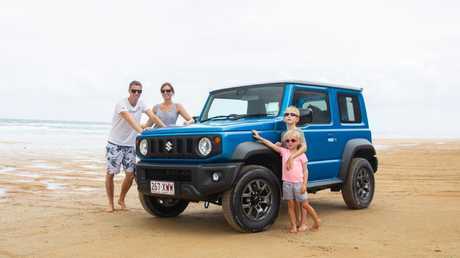 SHOVING aside small faux-wheel drive SUVs, Suzuki's new Jimny arrives with serious retro cool plus genuine off-road talent. Fun, stylish, great value, able to climb mountains and one of this year's most eagerly awaited cars, the Jimny arrives with a bargain $23,990 before on-roads price tag for the manual version. Can it serve as viable fun transport for our family of four? Jules: I know you're going to bring up your 1986 Suzuki Sierra and how we had to sell it when we had children. Iain: I loved that car. It went anywhere. Jules: Well, here's your modern retro equivalent, all boxy, equally cute and far safer than your old one. 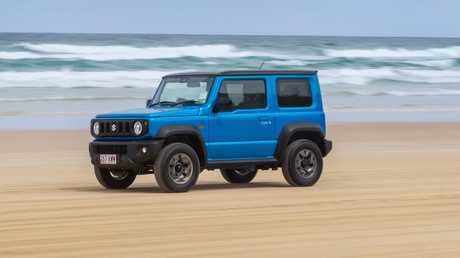 The new Jimny’s styling has some serious retro charm. Iain: And still one of the most capable 4WDs on the market. These new Jimnys weigh as much as a chip packet so they just fly over soft sand and rocks. Jules: It's a funky, chunky but tiny thing. I love the black roof, dark alloys and rear barn door with spare wheel attached. 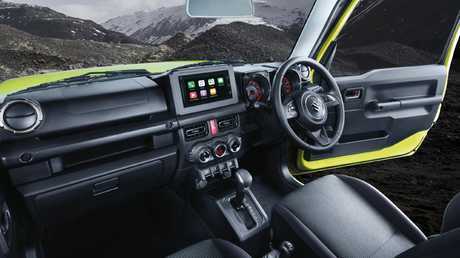 Iain: Great how Suzuki has dropped the outgoing Jimny's softer design and replicated the boxiness of the 1980s SJ Sierra. Like my old one. That you made me sell. Jules: Buy one of these then. They're only $24K, plus $1250 for the paint. Iain: Only white is free sadly, and there should be more colour choices than Suzuki's palette. Jules: True. Regardless, if you're looking at small SUVs the Jimny is great value. Iain: Similar money will get you a front-wheel drive Mazda CX-3 or Mitsubishi ASX. I'd rather take roller-skates off-road. Jules: It's titchy inside but there are two good cup holders, space for a phone and it's certainly light and airy. Iain: You sit up high, there's huge headroom and the large and long windows give brilliant outward vision. Jules: Switches and dials are chunky, round air vents are stylish and I'm amazed to see a touchscreen. The Jimny has a decent amount of kit for the price. Iain: Almost mandatory these days. And with Apple CarPlay/Android Auto and satnav, it's got the modern toys. Jules: The infotainment is slow to connect to my phone and the audio is hardly concert hall standard. Iain: Hence the cheap price. And also why hard plastics dominate. The seat material looks as if it'll stain too; not great for wet boardshorts, muddy pants or sunscreened skin. Jules: I'd definitely option some rubber floor mats. Iain: I may like the old school looks and 4WD ability but the ride and cabin noise bring back less happy memories. Jules: There have to be some compromises. It did feel hairy at highway speeds in the wind, getting pushed around a lot. Iain: And running at 3000rpm at 110km/h means the little 1.5-litre is noisy on the highway. Good to have cruise control though. Jules: If you have a city commute it's fine. It's so small for zipping between traffic. Iain: You have to treat corners gingerly too. It is wallowy and leans in the turns - but drop the speed and it's a joy to punt along. There isn’t much cargo space with the rear seats up. Jules: Leave the two independently foldable rear seats down and there's plenty of room for the shop, and with the barn door it's so big and easy to access. Iain: If you have two child seats tethered in, it's a different story. Jules: Indeed. You need to remove the handy rear luggage box to fit child seats, leaving you only space for about two shopping bags. Iain: Proving the Jimny's no family car. You can barely fit a slab of beer behind the two rear seats when they're up. Jules: Positively, it's so easy to park thanks to its tiny size and reversing camera. Iain: Beach drive. No question. Jules: It was at its most comfortable when we took it on the sand. I can't believe how capable it felt. Iain: Old school helps. It weighs less than 1100kg, has a ladder chassis, low range, 210mm ground clearance and excellent approach and departure angles. Jules: Right. What you said. I just appreciated how it never ever felt like it would get stuck, and it was easy enough to put into 4WD mode or low-range with the little shifter. Iain: It was impressive through very soft sand. Suzuki's AllGrip Pro worked superbly, applying braking force to any slipping wheel. 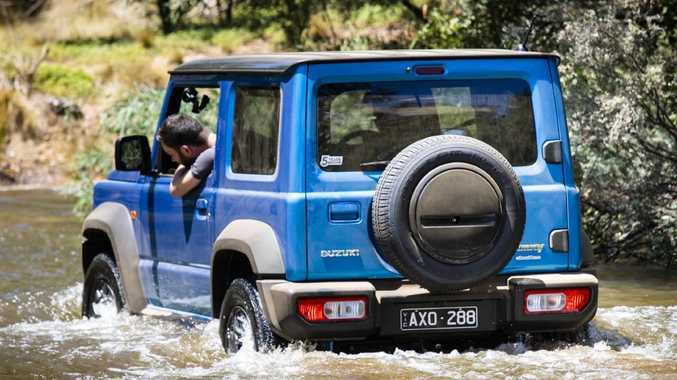 The Jimny lets you get to those had to reach places. Jules: If you're a family of one or two, it's OK.
Iain: Indeed. With rear seats permanently down there's room aplenty for camping gear or sports kit. Kids? Not really. Jules: They loved it though. Like a big toy car, they said. But it was really hard getting them in their seats with it being a two-door. Iain: Come on, it's fine. You just slide the seats forward. And actually, there's handy storage beside their car seats above the wheel arches. Jules: OK, the rear windows don't open and there are no rear air vents. You can clean up the vomit. Iain: There's safety kit - autonomous emergency braking and lane keep assist - but the three-star crash rating puts me off as a parent. 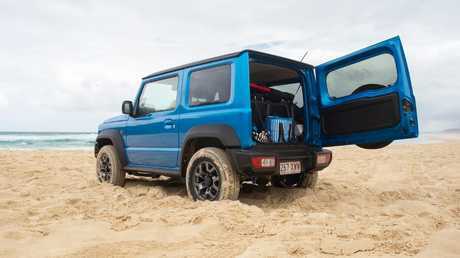 Jules: For singles or couples liking cool style and off-roading talents, the new Jimny looks perfect. Why pay more? There's so much fun to be had. Iain: Not the comfiest on highways or corners but I'd forgive this car anything. Brilliant off-road, head-turning looks and smiles for miles. No wonder there's a long waiting list already.